Give your canine friend the digestive support and balanced nutrition he needs to live his best life with Holistic Select Large & Giant Breed Chicken Meal & Lentils Natural Grain Free Dry Dog Food. Formulated for dogs 50 pounds and up, this grain-free recipe contains optimal levels of calcium and phosphorous for bone strength, as well as glucosamine hydrochloride and chondroitin sulfate for healthy hips and joints. 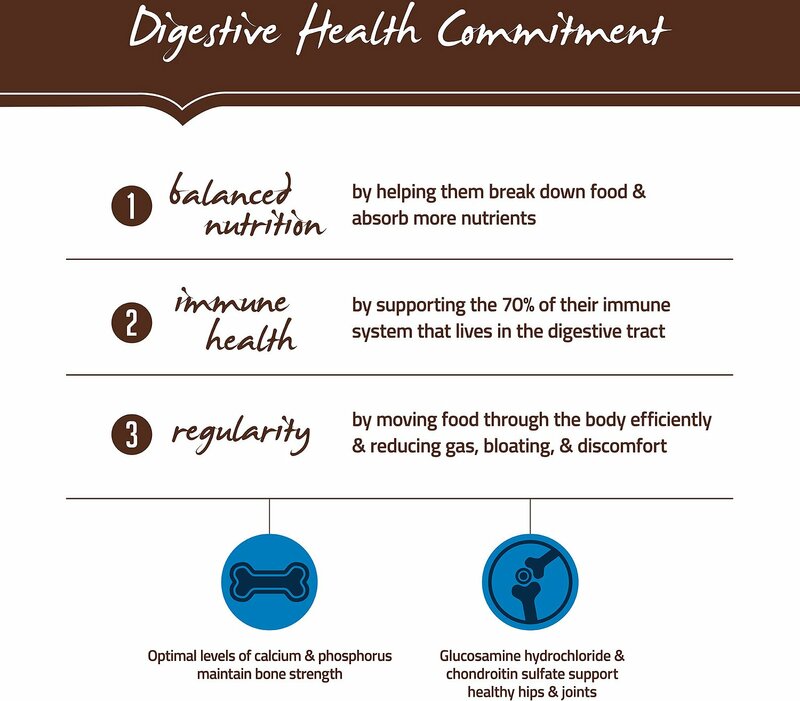 Prebiotics, probiotics, live yogurt cultures, digestive enzymes and natural fiber enhance digestion and support total body health. Nutritious fruits and veggies including pumpkin, cranberries, blueberries and pomegranate provide essential vitamins, minerals and antioxidants to support strong immunity. 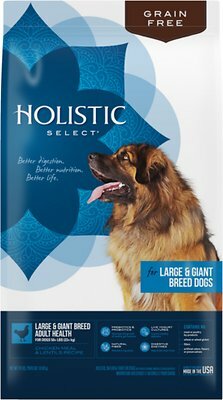 Perfected to deliver balanced nutrition that supports the 70% of your large breed dog’s immune system that lives in his digestive tract. Grain-free recipe contains calcium and phosphorous for bone strength, as well as glucosamine and chondroitin for healthy hips and joints. Live yogurt cultures, natural fiber and digestive enzymes enhance digestion and promote intestinal regularity; omega fatty acids from flaxseed support healthy skin and coat. 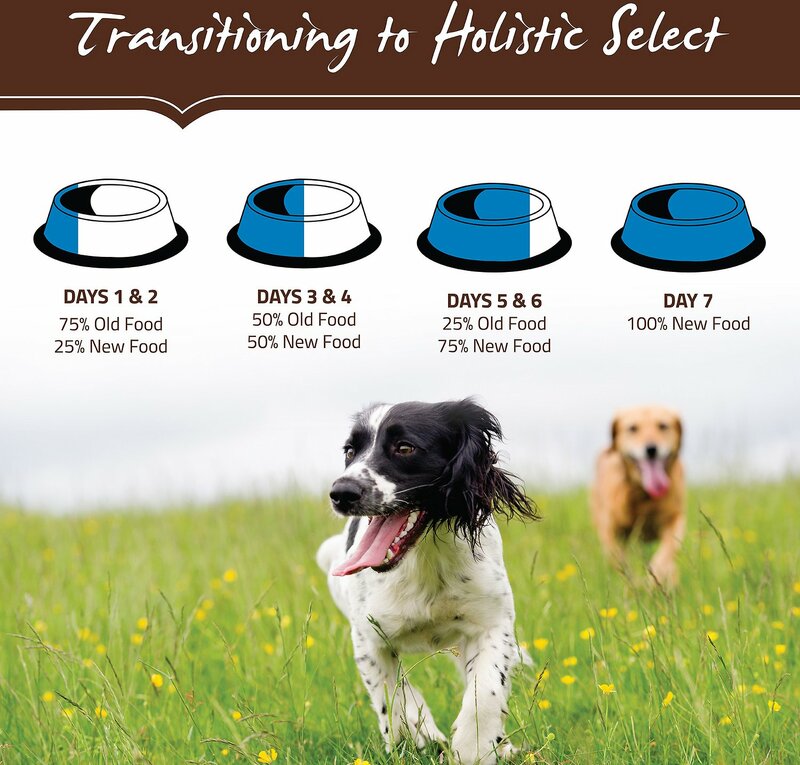 Formulated for dogs 50 pounds and up; potatoes, peas and lentils deliver highly digestive carbs for sustained energy. Made in the USA using the finest globally-sourced ingredients with no corn, meat by-products, artificial colors, flavors, fillers or preservatives. Dogs over 160 lbs: Add 1/3 cup per additional 10 lbs. 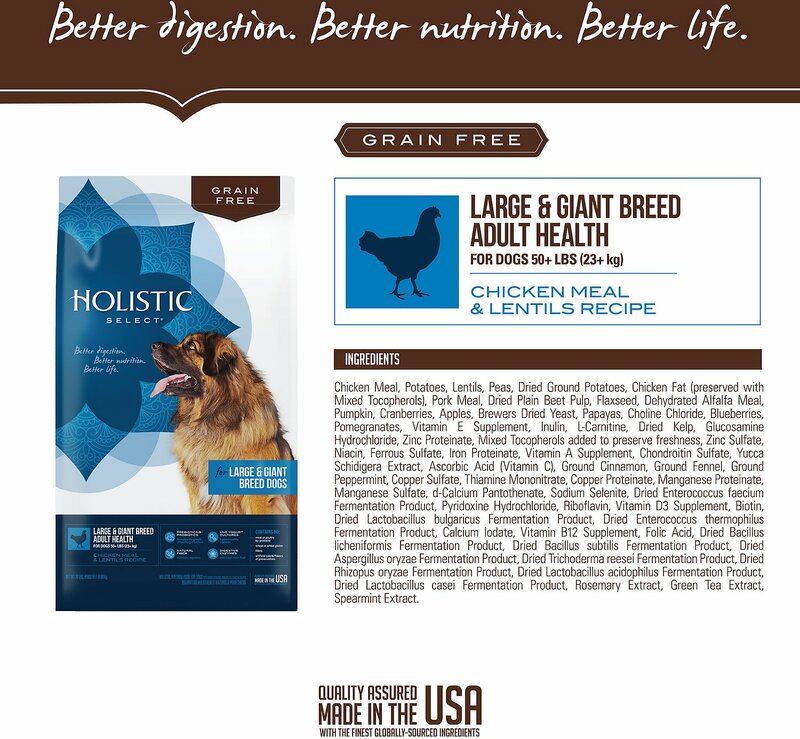 Standard measuring cup holds approximately 3.7 oz of Holistic Select Grain Free Large & Giant Breed Health Chicken Meal & Lentils Recipe. Combination Feeding: If feeding Holistic Select wet food, reduce dry amount by 1/3 cup for every 6.5 oz of wet food. I was disappointed in the size of the kibble. It is very small like puppy food. I was hoping that since it says it is for large and giant breeds that the kibble size would be large. I have a picky eater Akita. So far she is not eating her meals right away. It is not good enough tasting for her to eat the food when it is put down. I'm pretty confident to say, that I'm more energetic and happy since I start this new food, I poo when I have to, now, before my metabolism starting to be slow and I had a lot of gas after every meal, but Im not having any bowel issues since Istart this new brand, so happy . I foster dogs with puppies. Of course, moms need good food but when the pups are weaned, I cannot handle all the poop from puppy food or even regular food. I have to do grain free. I got this stuff on sale and everyone loved it-my dogs, moms, and puppies. It is expensive but worth it in clean-up cost and, for all the dogs I feed, their nutrition. And because I am fostering for a non-profit, I can write off the cost. 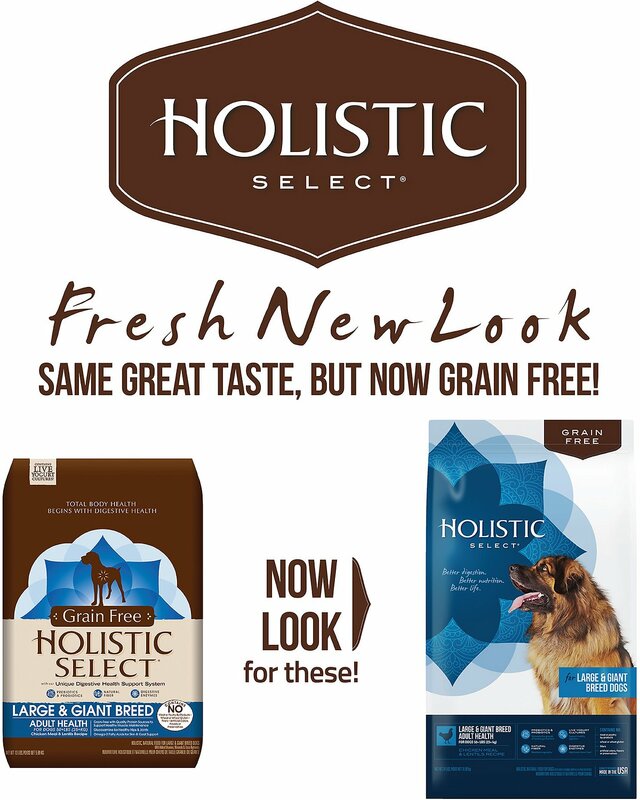 This food has been perfect for my dane who has had digestive issues in the past. He has been eating this for at least a year and he loves it. 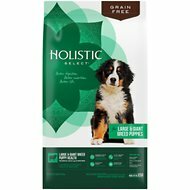 I highly recommend trying this grain free option for any large/giant breeds that are struggling with stomach sensitivity. 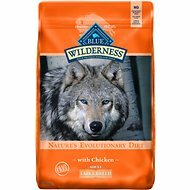 I have 2 German Shepherds and I have fed them this since they were both pups. They enjoy the flavors of the food and it also keeps their digestive systems healthy. I won’t buy them any other food than this. This food is great. Left my dogs coat sleek and shiny. They'll eat anything.... purchased on sale for variety for them. Excellent delivery, 1 day! Our 12 month old Berner loved the puppy chow but did not like this Adult Chicken & Lentil chow. I have a Dane with digestive issues. She seems to do better on the no grain diet vs the regular version. I do wish the bites were bigger though.